A few days ago I had one of those beautiful writing days when everything was coming together. The words were flowing from my quickly tip-tapping fingers and I felt that it was making sense. Sure, there were moments of difficulty and I’m also more than certain that there were some phrases in what I wrote that, when I eventually get around to looking at them again, will make me blush. But that hardly matters. Any pages produced automatically qualify as good pages. But a girl can write for only so long before the words run dry. One must also stand and stretch one’s legs. Eat. Emerge from the funk of one’s solitary thoughts and narrative structuring. And sometimes, in that moment of respite from the keyboard, you randomly decide to make the biscotti that’s been on your mind for months now. Obviously, cardamom, being the best possible spice for most things, was the obvious choice for a dominant flavor. My crush on cardamom hasn’t faded; we are as tight as ever. And dissertating just so happens to make me hungry; during the mid-afternoon, I often find that I need something to chew on as I ponder the next step and make myself a cup of tea. Plus, since I currently don’t have time to read my New Yorkers, I thought it might be fun to use them as bright and colorful backgrounds. Creativity comes in all shapes and sizes. But you know, whereas I usually have trouble writing and then the baking seems like the fun, easy and infinitely preferable alternative, this time around it was the opposite. The dough was crumbly, as most doughs with ground almonds tend to be; shaping it into a log was an incredibly frustrating experience–so frustrating, in fact, that I briefly considered making cardamom cookies instead. Being stubborn until the bitter end however, it became a simple matter of pride: the dough would be turned into a log or else. I offer no excuse for my absurdity other than the fact that writing does funny things to the mind. 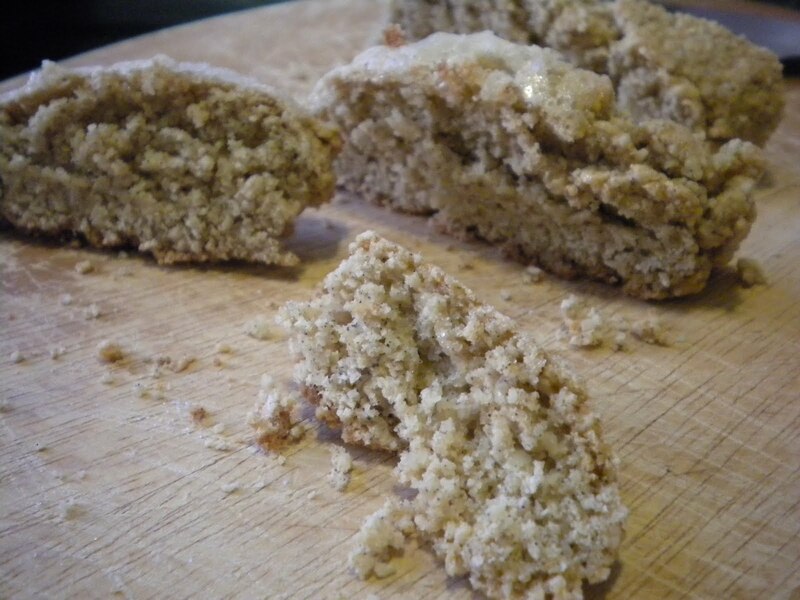 And, you know, just like with writing, if you keep at it for long enough, crumbly biscotti dough will eventually look like what you expected all along. It may not be perfect, yielding some tiny slices of biscotti–baby biscotti also has a lot of charm and lots of tea-dunking potential!– but who cares? Flaws make things infinitely more interesting anyway. I made several important changes to this recipe. Firstly, when I realized I didn’t have enough granulated sugar, I decided that brown would have to do. This maybe slightly changed the consistency (and perhaps accounted for my log-rolling difficulty), but I think that the brown sugar complemented the cardamom quite well. Also, I added a tablespoon of ground cardamom after I realized that the cardamom pods I had painstakingly cracked open were too small to be crushed in my food processor (it was worth a shot). As far as I’m concerned, when it comes to cardamom, the more the merrier. Also, I should note that, whereas the Martha Stewart site says that this recipe should yield 30 biscotti, I ended up with a mere 18–and that was even counting the baby biscotti. -Preheat oven to 325 degrees. Place rack in center of oven. 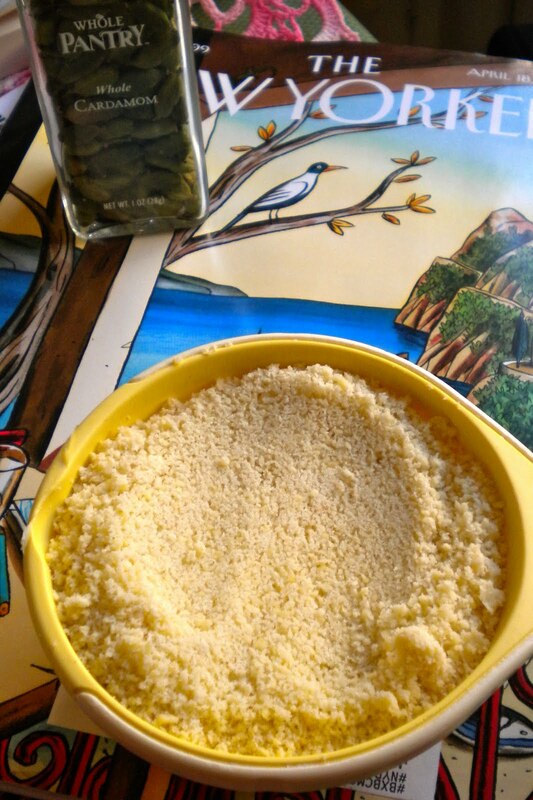 -Sift flour, baking powder, and a pinch of salt into a large bowl. 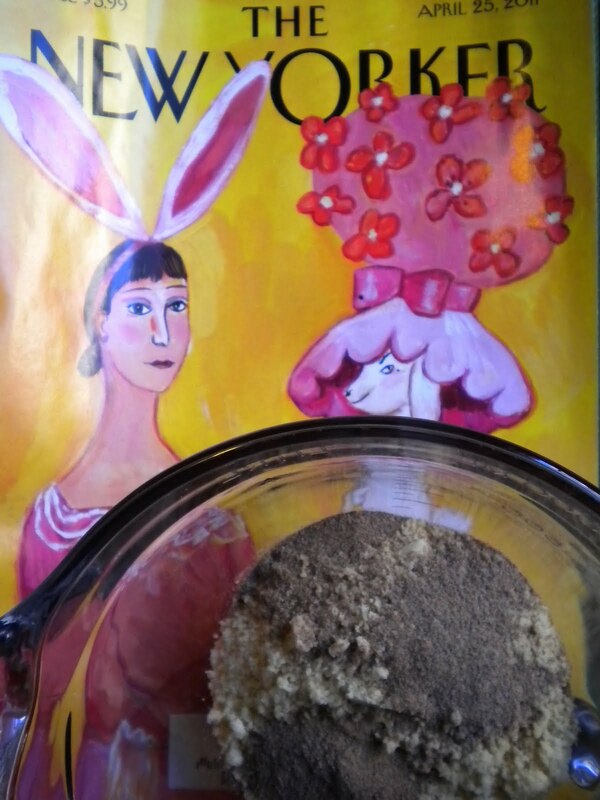 – Mix almonds, cardamom, and 1/2 cup plus 2 tablespoons sugar into flour mixture. – Beat eggs and vanilla, then mix into dry ingredients until well combined. 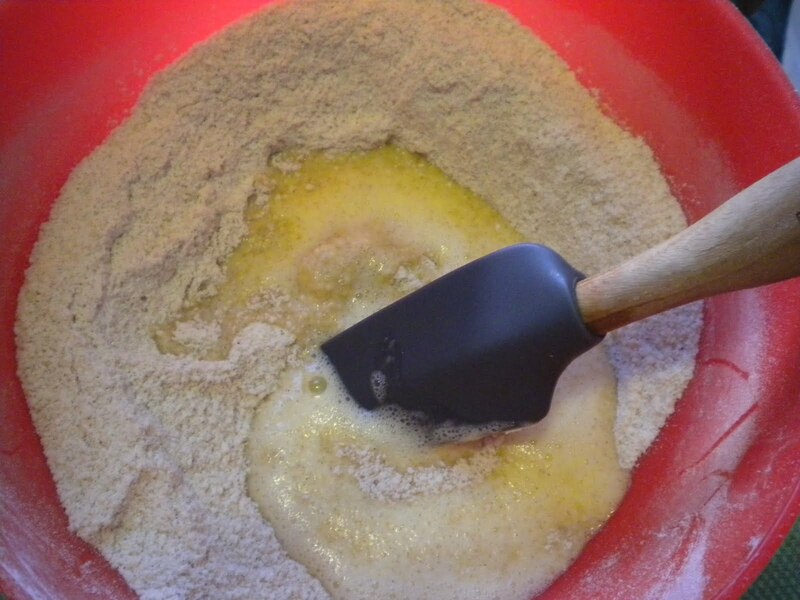 -Turn out dough onto a lightly floured surface. – Roll dough into a 9-by-2-inch log. -Transfer to a parchment-lined baking sheet. -Press gently to flatten top. 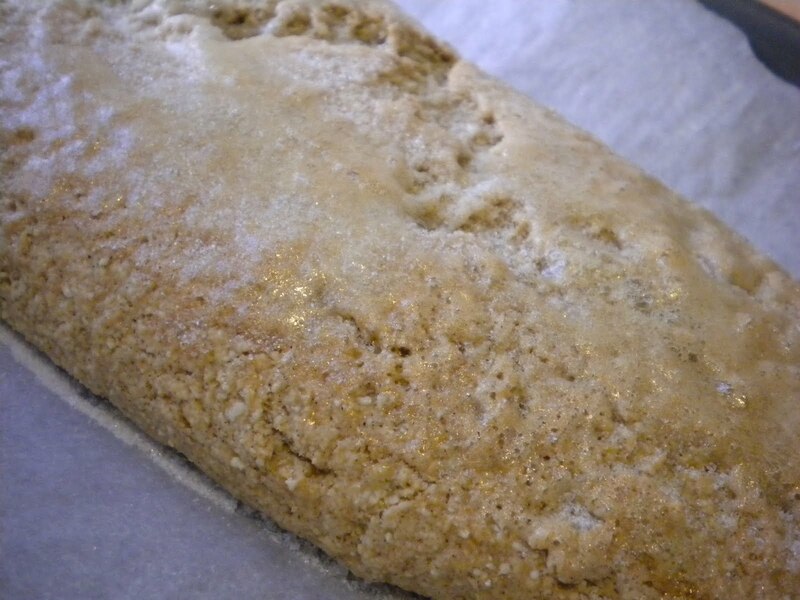 -Bake until pale gold and lightly cracked, about 30 minutes. 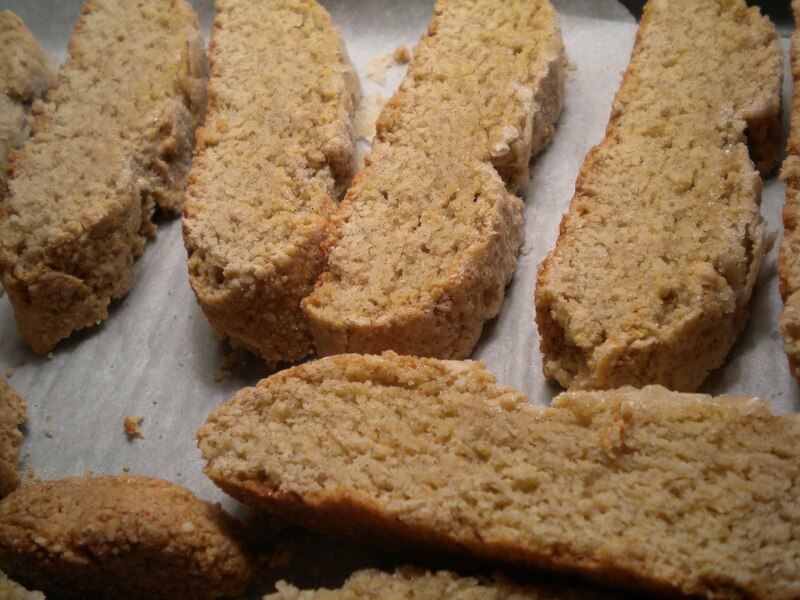 -Lightly beat egg white, then brush onto biscotti. -Sprinkle with 2 tablespoons sugar. Bake 15 minutes. Let cool for 10 minutes on baking sheet on a wire rack. -Transfer to a cutting board. Using a serrated knife, cut dough into -inch-thick slices. -Place slices, flat sides down, on baking sheet, and bake until golden brown and crisp, 15 to 18 minutes. I fell hard for cardamon this past winter. I would highly recommend cardamom hot chocolate topped with cardamom whipped cream. Oh happy day.